• Compression garments worn at certain times of compromise to prevent tissue fluid accumulation. • Manual Lymph Drainage (MLD), a light massage-like technique, which moves tissue fluid from congested to non-congested areas. • Therapeutic exercises to safely enhance lymphatic circulation. 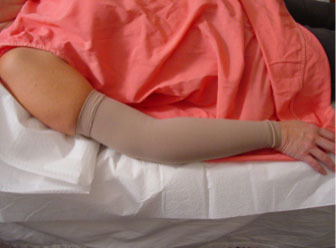 An improperly fit compression garment could cause compromise rather than benefit, as shown below.